Rub the tomato in the coarse side of the grater and cut garlic into slices. In a pot, put the onion and garlic together with a little water until no water is left. When the liquid has evaporated add the olive oil and sauté for 2 minutes. Pour the beans into the pot and stir until they are covered by the olive oil. Add half a cup of water, cover the pot and simmer until green beans are wilted. Add the potatoes, half the parsley, tomato, sugar, salt, pepper, a little more water and stir. Cover partly the pot and let simmer until left with the oil. Add salt and pepper if necessary. 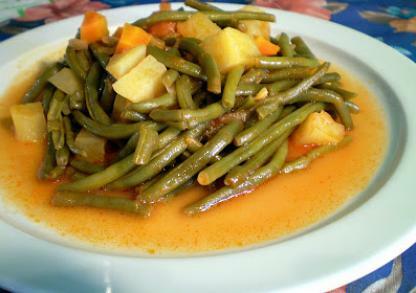 Some additional water might be needed, until the green beans are roasted left with some sauce and bit of olive oil. Sprinkle with a little more parsley and serve the food.